The council has confirmed it is planning to demolish the toilet block at Monks Recreation Ground in Lancing. A spokesman from Adur District Council, which owns and manages the toilets, said it was ‘a difficult decision’ that had been made as a result of ‘repeated acts of vandalism and reports of antisocial behaviour at the site’. The toilets were ‘completely gutted’ in an arson attack last September and have been closed ever since. The spokesman said: “We have made significant investment in repairing the building and facilities over the years but, much to our frustration and disappointment, vandals continue to cause damage. “The latest incident was a major arson attack in autumn. Since then, the toilets have remained closed. A spokesman at Lancing Parish Council said the facilities were ‘very well used’ before they were closed in September. Councillor Gloria Eveleigh, chairman of Lancing Parish Council, said public toilets had ‘general importance and value within communities’. “Parish councillors are extremely sorry knowing the affect the loss of this facility is going to have on local residents, including older people, and small children using the play facilities,” she said. 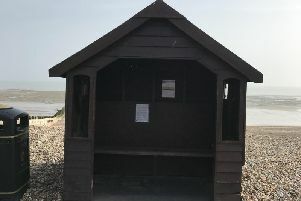 According to Adur District Council’s website, public toilets are provided in Lancing at Beach Green in Brighton Road, Shopsdam Road, Widewater (West Beach Road) and Yew Tree Close (off South Street). Earlier last year, members of the Lancing and Sompting Liberal Democrats wrote to Adur District Council calling for new public toilets to be installed in the centre of the village. But at the time, councillor Emma Evans, executive member for environment at Adur District Council, said there were ‘no plans’ to provide any new toilets. She said: “We are one of the few councils still investing in our public toilets across the district. Comparing our provision to neighbouring Brighton and Hove, who have closed the majority of theirs, I think with budget constraints we are doing ok.